Night Splints - Doctors have recognized that something needed to be done about night- time positioning of the foot since the early 90s. The first doctors to do this were 2 podiatrists from Temple University, Dr.’s Wapner and Sharkey, who fashioned some splints for their patients to wear at night. The contraptions basically resembled the back half of a ski boot, designed the bend the ankle and bring the foot back to slightly less than 90 degrees. They were followed by many others office fabricated and commercial designs with varying degrees of success. The problem had always been that these night splints were hot, bulky, and cumbersome. Patients don't like to wear them. Doctors know that and therefore don't like to prescribe them. This is where the idea for the Strassburg Sock was born. The Strassburg Sock Solution - The Strassburg Sock was created out of necessity by my father, Terry Strassburg, in a desire to find an effective solution for his own case of plantar fasciitis. Dad was a runner who couldn't run, not a place any runner wants to be. He had gone through the cycle of initial relief through stretching. Then, visits to the doctors for medications, a cortisone shot (which this twice wounded Vietnam veteran described as one of his most painful experiences ever), and the big plastic night splint boot. After a few nights of trying to get a restful night sleep in boot he realized there had to be a better way. One night, literally in the middle of the night, he crawled out of bed, pulled a long tube sock from his dresser drawer. He gently woke my mother and asked where he could find a strip of fabric about so-long. She told him where to find it and warned him that if he broke her sewing machine there would be hell to pay in the morning, turned away and went back to sleep. Dad worked for a bit until he had rigged together something that he thought would hold his foot in the same position as the boot, just do it more comfortably. He slipped it on his leg and went back to sleep. When he woke up the next morning he noticed that his foot did feel a little better. He continued to wear it for the next few nights, after which the morning pain totally went away. He was so excited that he made a comfortable alternative he could comfortably wear. He didn't know that there was more to the story than just comfort. The Windlass Effect - What dad didn't know is that the reason the sock worked so well was because of something called the Windlass Mechanism. First described in the medical literature by Dr. Hicks way back in 1954, it basically can be described as a tightening of the plantar fascia by bending your toes backwards towards you knee. You can see it in action by doing this: Place one hand in the middle of your arch. Use the other hand to pull your toes back. 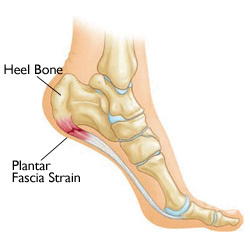 That band of tissue that tightens and pops up out of the bottom of your arch is your plantar fascia. Most night splints are rigid on the bottom, where you put your arch. When dad created the sock in a effort to make it more comfortable he didn't put anything rigid on the bottom. The effect is that the stretch applied is focused on the toes rather the foot and ankle, the windlass mechanism is engaged, and the plantar fascia is directly stretched while sleeping. Just like we used before in the knuckle example, allowing the fascia to heal in a stretched position at night speeds recovery and maintains the benefits of any daytime treatments. Stop into Fleet Feet Sports Santa Rosa today and let their FIT Professionals show you how the Strassburg Sock can get you moving again!